"How did you get this number?" Those were the first words Jill Biden spoke to U.S. senator Joe Biden when he called her out of the blue to ask her on a date. Growing up, Jill had wanted two things: a marriage like her parents'—strong, loving, and full of laughter—and a career. An early heartbreak had left her uncertain about love, until she met Joe. But as they grew closer, Jill faced difficult questions: How would politics shape her family and professional life? And was she ready to become a mother to Joe's two young sons? She soon found herself falling in love with her three "boys," learning to balance life as a mother, wife, educator, and political spouse. Through the challenges of public scrutiny, complicated family dynamics, and personal losses, she grew alongside her family, and she extended the family circle at every turn: with her students, military families, friends and staff at the White House, and more. This is the story of how Jill built a family—and a life—of her own. From the pranks she played to keep everyone laughing to the traditions she formed that would carry them through tragedy, hers is the spirited journey of a woman embracing many roles. Where the Light Enters is a candid, heartwarming glimpse into the creation of a beloved American family, and the life of a woman at its center. Jill Biden is a professor at Northern Virginia Community College and a former Second Lady of the United States. As Second Lady, she advocated for military service members, veterans, and their families; community colleges; the fight against cancer; and the education of women and girls around the world. 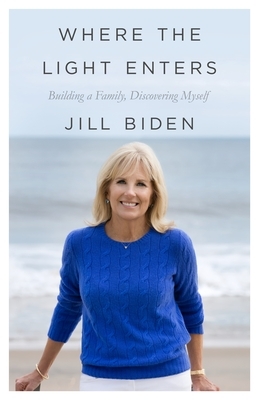 She continues this work today through the Biden Foundation, the Biden Cancer Initiative, and the Beau Biden Foundation for the Protection of Children. Dr. Biden is married to Vice President Joe Biden.